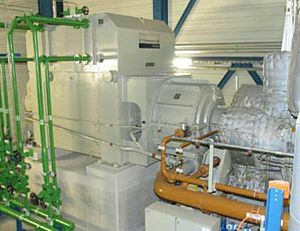 E-PACK® epicyclic gear units are applied between turbine and generator in the power generation industry. In order to minimize the required space, the gearbox housing is directly mounted to the generator as shown in the top figure. On the left hand side, a generator with connected E-PACK® epicyclic gear unit is shown. The right hand side shows the thermally insulated steam turbine. The up to date most powerful E-PACK®-gear unit with a rated power of 30 [MW] should be optimized with respect to structure and air borne noise already in the design phase. The mid figure shows the FEA model of the gearbox including the complete generator and the turbine shaft. On the right, the gear set is shown in more detail. 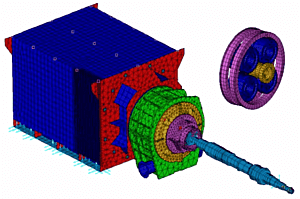 This FEA model was used for a numerical modal analysis and succeeding forced response simulations considering imbalance excitation and diverse excitations in the gear meshes. The resulting structure and air borne noise was analyzed and the gearbox was optimized with regard to minimum structure and air borne noise. Additionally, the dynamic factor of the gear mesh was determined. After completion of the power line, extensive validation measurements were performed. Besides an experimental modal analysis and operating vibration measurements at diverse load conditions, the sound power level was determined with a sound intensity analyzer. These measurements confirmed all substantial predictions of the simulations. In particular the optimization of the gearbox was successful. As an example, the bottom figure shows the measured and the predicted sound power level. For the octave bands above 63 [Hz] the values differ by not more than 6 [dB(A)]. 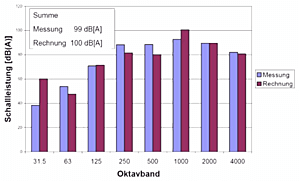 The total sound levels even match within 1 [dB(A)]. The largest differences are observed for 31.5 [Hz] octave band which can be explained by the simplified assumptions for the radiation factor.